Vulcan leaves RAF base for last time Jump to media player Crowds watch as the Vulcan bomber takes off from RAF Waddington in Lincolnshire for what could be the last time. Red Arrows perform final UK show Jump to media player The Red Arrows perform their final UK display of the year. Plane spotters get Typhoon shock Jump to media player Plane spotters got a little too close for comfort to a Typhoon jet coming into land at a Lincolnshire base. Crowds flock to RAF Waddington Jump to media player More than 145,000 people visited the Waddington air show, to watch displays from the Red Arrows. 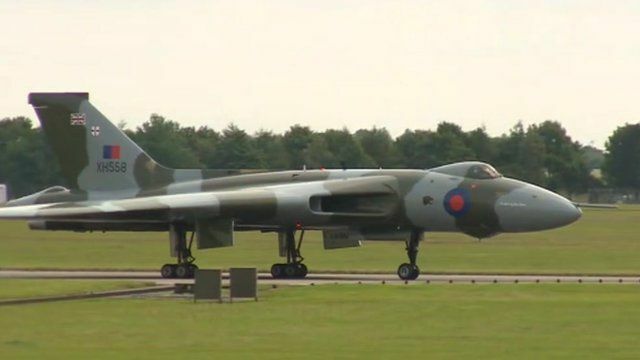 It was the last chance for people in Lincolnshire to see the Vulcan bomber in action on Friday. Crowds gathered at RAF Waddington to watch the Vulcan XH558, which was delivered to the base in 1960, take off and perform a special flypast. The Vulcan's engines will reach the end of their life next year and Waddington's runway will also be out of service for repairs in 2015.